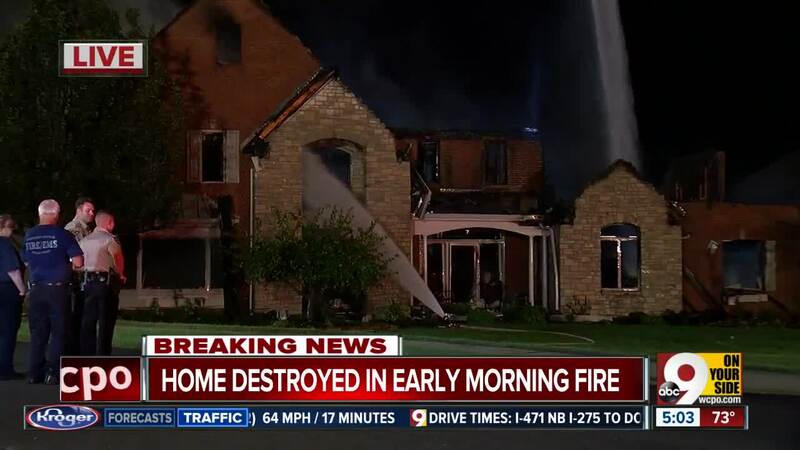 VILLA HILLS, Ky. -- Fire officials said a lightning strike caused a massive fire and destroyed a home in Villa Hills early Friday. Crescent Springs/Villa Hills Asst. Fire Chief Gary Foltz said the fire started at about 12:30 a.m. after lightning hit the home in the 900 block of North Oak Drive. Foltz said someone nearby at a senior living facility on Amsterdam Road spotted the flames and called 911 at about 2:45 a.m. -- more than two hours after the fire started. More than 25 firefighters from multiple agencies responded to fight the fire as it engulfed the home. No one was inside at the time of the fire and there were no injuries, Foltz said. Organizers with the American Red Cross also arrived on the scene to help provide relief for firefighters.